We’re delighted that you’re considering improving or expanding your outdoor living space. This has become a very popular project for many homeowners, and more and more of them are using Real Wood. Real wood is the most sustainable and renewable building product you can use and remains the most economical and environmentally friendly decking option available. Treated wood solutions provide incredible value and will actually outperform and outlast alternative wood decking products. Recent advancements in wood treatment solutions now include exceptional performance enhancements that will significantly reduce the initial maintenance requirements on decks, and improve the long-term appearance of deck surfaces allowing the beauty of the real wood to shine through. Wood is the most sustainable building material available. As a raw building material, wood’s merits are extensive and wood creates far less carbon dioxide emissions than competing building products, and the sustainability movement and green building initiatives have been adopted into several model building codes and national standards. Treated wood preserves wood against termite attack and fungal decay, lengthening its serviceable life and extending the benefits of using wood even further. Wood is the only naturally renewable building material and it is documented that for decades forest growth in North America has exceeded forest harvest. Moreover, advancements in wood product manufacturing technology continue to improve wood's sustainability after it is harvested. According to national surveys, more than 80% of all U. S. decks are entirely or partially built with preserved wood. This figure translates to around 30,000,000 wood decks in the United States and that number is increasing year by year. Even though some people use some naturally durable species of wood or different types of artificial wood for their decks, the biggest majority of them choose pressure-treated wood for their decks. Even when they use redwood or composite decking for their decking platform, they still usually use preserved wood for posts, beams, and joists because it is able to withstand deterioration in ground contact and because of its structural strength. Builders and homeowners choose treated wood, which is sold in the majority of home improvement stores and lumber outlets, for a variety of reasons. Pressure-treated wood is natural in appearance, which lends itself to a more relaxing outdoor living space. It is resistant to termites and rot, and it is a plentiful and renewable resource. Add this to the fact that treated wood is usually the most economical choice, it quickly becomes apparent why pressure-treated wood is the material of choice in building decks. One reason that makes pressure-treated lumber so economical is that there are different grades of lumber that can be used to construct different parts of decks. These grades are determined by certified graders at the sawmills who, prior to treating the wood, stamp each piece of wood with its grade. For the parts of a deck where the wood is in plain sight and a more evenly finished appearance is desired, such as on the platform and railing, a better grade of wood, such as Premium or No. 1, is generally the norm. Where the wood is hidden from view, such as the deck joists, a more economical grade such as Standard or No. 2 is usually chosen. By using a more economical grade of wood on the inconspicuous parts of the deck, the cost is minimized. Standard or No. 2 wood is also a great choice where a more rustic look is desired such as in a retaining wall. There is no other building material available that is as sustainable as wood is. As a raw building material, responsibly sourced wood has an extensive list of merits. The products you choose to build and remodel different structures with has a significant impact on the environment. Whatever materials you decide to use, it is important to consider the environmental aspects of its life cycle. · Wood creates far less carbon dioxide emissions that pollute the air than competing building products. · Wood products also cause less water pollution, have a smaller carbon footprint and have less embodied energy than do other materials that are commonly used in the building trade. · The sustainability movement and green building initiatives have incorporated wood into their stringent building codes and national standards. · Properly treated wood preserves wood against termite attack and fungal decay which lengthens its serviceability and further extends the benefits of using wood. · Wood is the only building material that is naturally renewable. Documentation shows that forest growth in North America has exceeded forest harvest for decades. · Technological advancements in wood product manufacturing continue to improve wood’s sustainability after it is harvested. · Wood is also considered an energy efficient product. · Wood’s durability and adaptability create many different opportunities for renovation, reuse and recycling, all of which help to make it a sustainable product that depletes less of the earth’s vital resources. · Sustainable forestry has become of major importance in the wood supply chain because it plays an integral part in the health of our planet. These managed forests help the planet by providing clean air and water and natural habitats for plants and wildlife. They additionally create employment opportunities for nearby communities. · There is an independent forest certification system in place to assure you that the wood you use comes from sustainable, well-managed forests. The forests receiving these certifications are committed to making sure that their water, air, soil and wildlife habitat resources will be conserved and that they will be replanted with native species. This council is an international system that covers forest management practices. It also tracks and labels certified products and paper products with recycled content. This initiative is a sustainable forestry management standard that targets large industrial operations in the United States and Canada. This association sets a national standard for sustainable forestry management as well as tracking and labeling certified material covering operations in Canada. The ATFS is a program of the American Forest Foundation (AFF) that sets its standards of sustainability and contain its requirements for the implementation by, and independent certification of, group organizations that manage a number of group member properties under one centrally administered program. The Group Organization holds the single certificate on behalf of the group members. PEFC is the world’s leading forest certification program and is the certification system of choice for small forest owners. It is a non-governmental, non-profit organization dedicated to promoting sustainable forest management. The principles, objectives and measurement criteria that form the basis of global sustainable forestry management are promoted in each of the above certification programs. Life Cycle Assessments (LCA’s) provide a view of the sustainability of wood as a building product. Let’s take a look at some LCA’s that have been done for different wood materials. The environmental impacts associated with the production, use and disposal of ACQ-treated decking and composite decking is the topic of a new life cycle assessment (LCA) report from the Treated Wood Council. The six-page document, “Conclusions and Summary Report on an Environmental Life Cycle Assessment of ACQ-Treated Lumber Decking with Comparisons to Wood Plastic Composite Decking”, notes the benefits of using treated lumber decking in terms of energy and resource use, lower environmental impacts during its manufacture plus the recoverable energy from out-of-service wood products. Click here to read the report. “This report goes a long way in defining the merits of using treated Southern Pine decking over composites,” comments Richard Kleiner, SFPA’s senior director of treated markets. “This is an impartial, in-depth study following ISO 14044 standards,” he adds. This report is now posted on the home page and several inside pages of SouthernPineDecks.com. It is also available for download from the Publications, Pressure-Treated and Garden & Outdoor Living pages of SouthernPine.com. The results for treated wood marine piles are very similar to those of ACQ-treated decking, where less energy and fossil fuel are used in production, and fewer greenhouse gases are generated during the lifespan. Click here to read the report. Responsibly sourced wood is the only renewable building material available. Not only does it remove CO2 from the atmosphere, but it is naturally grown. As forests are replanted, they will regrow and provide a wide range of other benefits, such as further carbon storage, oxygen generation and forest habitats for wildlife. Because the wood is constantly being replenished, it is a natural green building material. Life cycle assessment (LCA) studies consistently prove that its performance level is far superior to other materials in terms of embodied energy, water pollution and air pollution. Growing trees absorb harmful carbon dioxide from the atmosphere which naturally purifies the air. Through the process of photosynthesis, the carbon created from the carbon dioxide gets stored in the wood fibers of a tree, which then releases oxygen. This process of creating oxygen creates healthy air for people and animals to breathe. When the trees themselves are harvested, the carbon that they have captured remains in the wood fibers. Even more importantly, more than half the energy used in the manufacture of wood products in the United States comes from the tree bark, sawdust and papermaking by-products of the wood itself. This efficient use of wood forms the energy source to make the products that are derived from the wood. This is especially true in the United States and Canada where wood product companies use nearly 99% of the wood they process at pre-consumer recycling facilities such as sawmills and at secondary wood processors such as furniture and cabinetmaking facilities. This results in very negligible wood waste. With all the problems resulting from climate change, it is important to use materials and processes that don’t add to the problem. Wood is the only building material that tackles climate change, and it does so by both removing carbon from the atmosphere as well as by reducing new carbon emissions from going into the atmosphere. As trees grow, they absorb the carbon dioxide that is in the air, which they store as carbon in the wood. Because of this unique ability, about 50% of the dry weight of wood is carbon. When the trees are sustainably harvested and used to make wood products, the carbon is stored within for the life of the product, which keeps the carbon out of the atmosphere indefinitely. Wood can be used as a low-emission substitute for materials that require much larger amounts of fossil fuels to be produced. The production and processing of it use much less energy (also known as embodied energy) than does the production and processing of other building materials thus creating a much lower carbon footprint. To understand this, we will give you an example. In converting one cubic meter of wood versus converting a cubic meter of a solid material such as concrete or brick, one ton of carbon dioxide will be eliminated from emission into the atmosphere. Let’s look at an example of greenhouse gas emissions. Embodied carbon emissions in the construction sector accounted for over 23% of total greenhouse gas emissions in Australia. Over and above operational processes like energy and transport, it is increasingly important to consider the embodied carbon emissions in building materials used in the sector. Through research, it has become known that spaces containing natural elements such as wood have measurable physiological and psychological health benefits. By increasing the use of elements such as wood in their environments, students learn better, workers are less stressed and more productive, patients heal faster, and people are generally happier and calmer. People instinctively feel an innate connection and attraction to natural materials such as wood. A review of some research from Canada and Austria revealed that humans automatically relax when they are surrounded by natural elements such as wood. In fact, these materials have been found to have a pronounced effect on the autonomic nervous system, creating a corresponding lowering of the blood pressure as well as stress levels. So, in whatever way you choose to bring wood into your living environment, its health benefits are more than just instinctive. These real scientific studies confirm the fact that wood helps you live a healthier life. Incorporating a biophilic design that employs the use of natural elements in your home such as wood, water, sunlight or plants may actually improve your overall health. When it comes to your health and wellness, this type of home design may prove to be as important as your diet, sleep habits or exercise routine. Whether you are purchasing a new home or doing a remodel, incorporating natural materials into your home is easily achieved. You can add wood to your ceiling, wainscoting or floors; or you might even want to have a featured wood wall. There are no limitations when adding these natural materials with their myriad of health benefits to your home. There are many wood homes and buildings that retain their stability and integrity even after hundreds of years. This alone shows that wood structures can endure as long as those made of other building materials. The keys to a structure’s longevity are careful planning and the understanding of how environmental loads and other external factors are likely to impact a wood building over its lifetime. In today’s market, there are wood preservatives that can further increase its natural durability. Viance is the manufacturers of D-Blaze, a chemical formulation that preserves wood from the elements and from a fire. Wood is very flexible, making it both structurally and aesthetically suitable for a wide range of building types and applications. This includes, but is not limited to, single-story homes, condominiums, multi-story office buildings, schools, industrial facilities, recreational centers, decks, fences and retaining walls. Its suitability as a structural material, which offers cost-effective ways to meet code requirements for safety and performance is well documented. However, it is also suitable as a finish material that brings warmth and natural beauty to interior and exterior applications. The versatility of wood becomes more prominent as each day passes, because of the new and innovative uses for wood that are being discovered due to advances in wood science and building technology. These advances continue to expand the opportunities for wood construction. Because wood is lightweight and workable, it makes it easy to apply to specific applications. It can be adapted in the field, allowing for quick solutions if changes are required. Wood is also well suited for additions and retrofits. Systems made of wood can be dismantled relatively easily and the materials used elsewhere. In North America, buildings are often demolished before the end of their useful service lives mainly due to increasing land values and changing needs as opposed to performance issues. If you consider the embodied energy in wood structures and issues related to their disposal, you will find that the adaptability of wood structures and building systems, either through renovation or deconstruction and reuse, is significantly advantageous. Energy consumption continues to grow with the growth of the world’s population, thus making energy efficiency critically important as we seek to improve our use of the planet’s finite resources. More and more homeowners are working towards a net zero goal which means that the amount of energy consumed in their home is roughly equal to renewable energy created by the home. This creates a situation where more attention is being paid to the building systems, the design and the appliances that best support energy efficiency. Wood naturally contributes to a building’s energy efficiency. Softwood lumber is an ideal choice to create an energy efficient home. This is because it is cost-effective, versatile, easy to build with and familiar to building contractors. An insulated wood framed home will be more energy efficient than a similarly insulated steel framed home, because of wood’s higher R-Value. The higher R-Value means that wood’s natural insulation creates energy efficient walls which use less energy for cooling in the summer and heating in the winter. 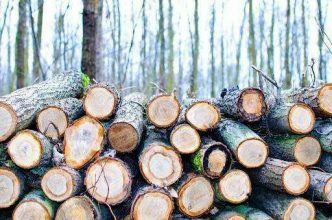 Moreover, wood has more than double the heat capacity of aluminum or concrete of equal weight, meaning that wood can absorb more heat before its temperature rises. Wood has by far the lowest heat conductivity among structural building materials making it easier to reach effective R-Value or U-factor insulation targets. This applies to wood-based wall systems when following current construction practices. One of the reasons that wood is a natural insulator is due to the air pockets within its cellular structure. It is 15 times better than masonry or concrete, 400 times better than steel and 1770 times better than aluminum as an insulator. Using wood, therefore, helps to reduce the cost of heating and cooling a building. Since 50% of the dry weight of wood is carbon, it is very strong and makes good material for building structures. This carbon stays in the wood for the life of the wood. Using sustainably harvested wood is a great option for the “bones” of your building project. You can’t duplicate the natural beauty and elegance that wood gives you. You can use it to create inspiring indoor and outdoor sanctuaries, enhance traditional architecture or bring warmth to the most modern design. Every piece of wood has its own individual beauty with its grain patterns and color variations. It adds unique textures and personality which can blend with any architectural style, adding character, dimension and charm to your surroundings like no other material can. “Planet Ark” has done research in which 8 out of 10 people thought that wood is versatile, recyclable, renewable and long-lasting. Not only did the respondents think that wood had those qualities, but an overwhelming 96 percent agreed that wood is “visually appealing” and has a natural look and feel to it. This research identified the positive associations that wood induces in people. Wooden buildings can be built throughout the year in most climates. Many of them are even prefabricated offsite, which makes them very fast and efficient to build. An example of this type of prefabrication would be modular or mobile homes. Another example would be the 18-story Brock Commons building in Vancouver which was built in just 9 ½ weeks. This prefabrication process can be used for anything from a small shed up to a huge building. Another thing that makes building with wood fast and efficient is that experienced wood contractors are widely available, and workers of varying skill levels can quickly learn wood construction methods. The addition of wood decks is one of the top remodeling projects to give you the best return on your investment. These additions boast an impressive ROI of nearly 82.8% which is higher than the ROI for non-wood decks, particularly composite decks which have decreased in value over the past few years. This incredible ROI is because wood decks are an affordable way to extend your home’s living space and deliver on the increasingly popular inside/outside living concept. Likewise, the use of wood in the framing and other structural applications in the construction of your home can save you time and money when compared to brick, steel or concrete. Wood is much less expensive to install than alternative materials such as steel, and it is easier to find contractors from which to choose because nearly all contractors are familiar with wood installations. This is validated in comparative studies of the economics of different wall framing systems, which indicate that, in terms of direct building expenses, wood framing is consistently the most cost-effective solution. North American wood products offer advantages in terms of material and construction costs. Wood’s relatively light weight can reduce the need for foundation capacity, and most communities have a large pool of skilled tradespeople with wood framing experience. When taken into consideration, it is found that these advantages minimize delays, keep labor costs competitive, and ease and speed up the construction process. All building systems are required to perform to the same level of safety, regardless of their material, and all wood-frame construction is readily accepted in the International Building Code (IBC). One example of this is that traditional light wood-frame construction, which has OSB or plywood sheathing, is accepted for a wide range of applications, even five-story mixed-use/multi-residential construction. Another important fact is that some wood products may even perform better in a fire situation than non-combustible materials. These would include the large beams used in heavy-timber and mass-timber construction. These beams are thick and solid, causing them to char at a slow and predictable rate. Due to the char, the wood is protected from further degradation which helps to maintain the building’s structural integrity and reduces its fuel contribution to the fire which further lessens the heat and flame propagation from the fire. There are different ways to maximize a project’s allowable size using wood. The designer’s options may include heavy timber construction, protected construction or the use of fire-retardant treated construction, which protects the integrity of wood structures during a fire. Our very own D Blaze treated wood is a great fire-retardant building option as it meets IBC building system codes. Wood structures can be designed for safety and code acceptance. The International Building Code offers a wide range of options for designing wood buildings. A basic understanding of how lateral loads impact wood framing systems is invaluable when designing structures in places prone to seismic activity. Another thing that is required in using wood under these circumstances is understanding how construction detailing and fasteners affect the performance of structures in these areas. By understanding the impact of lateral loads, construction detailing and fasteners on wood structures, we can understand how wood performs well in earthquakes. The forces in an earthquake are proportional to the structure’s weight. Since wood is substantially lighter than other major building materials, the structures built with them don’t have as much seismic force on them, making them resistant to lateral and uplift forces. Another benefit of wood buildings is that they tend to have numerous nail connections that result in more load paths and better redundancy. Should some of these connections fail, there are many more to maintain the integrity of the structure, which lessens the chance that the structure will collapse during an earthquake. Wood buildings can also dissipate energy when faced with the sudden loads of an earthquake because of their inherent ductility and repetition. Wood-frame buildings have shear walls and diaphragms that enable them to withstand lateral loads. All the related components, including the framing, the structural panel sheathing and the inter-element fastening details must be designed and installed properly to effectively resist wind damage. There is a transfer requirement in these structural systems for them to work as they are intended. First, the roof diaphragm must be able to transfer lateral loads to the shear walls. Then the shear walls themselves must transfer these loads to the foundation. This system is only as effective as are the quality and quantity of its connections. This suggests, then, that the key to constructing buildings that can resist lateral loads is in understanding how to design and install proper connections as well as understanding how forces are transferred. During hurricanes, roofing materials and sheathing loss is a leading cause of structural failure in buildings constructed of wood. Inadequate fastening of sheathing to supporting members and improper connection detailing between the structural systems are the most common reasons behind these failures during a hurricane. The things we have just looked tell us why there are so many benefits to using responsibly sourced wood. It is renewable, its production uses less energy and it leaves less greenhouse gas emissions. Another important factor for homeowners and the environment is that treating wood extends its life even further. This enables decks, outdoor furniture and other things built with the treated wood for outdoor use to last longer, thereby reducing demands on forests and other resources.